Tag line: "All you need is love"
The first time I saw director Julie Taymor’s Across the Universe, a movie that utilizes the music of The Beatles to weave a story of love, revolution, and war, I was swept up by its energy, and quickly fell in love with its singular style. It’s an affair I renew each and every time I watch this exceptional film. Set in the 1960s, Across the Universe tells the story of Jude (Jim Sturgess), a young man working in the shipyards of Liverpool who travels to America to track down the father he never knew. Once there, he befriends Max (Joe Anderson), an Ivy League college student who promptly drops out of school and, with Jude in tow, heads to New York. Max’s sister, Lucy (Evan Rachel Wood), whose boyfriend was recently killed in Vietnam, follows her brother to the city, and before long, she and Jude have fallen in love. All three live in an apartment / commune owned by the sultry Sadie (Dana Fuchs), a nightclub singer who’s also rented rooms to Prudence (T.V. Carpio), a confused lesbian; and JoJo (Martin Luther McCoy), a guitarist from Detroit who joins Sadie’s band. The good times come to an abrupt end, however, when Max is drafted into the Army and shipped off to Vietnam, putting Lucy’s and Jude’s relationship to the test when Lucy, hoping to save her brother, volunteers to work for an anti-war organization that Jude believes is much more militant than she realizes. From the character’s names alone, you get a sense of how influential The Beatles were on Across the Universe (“Hey, Jude”; “Lucy in the Sky with Diamonds”; “Dear Prudence”, etc). But it’s the band’s music, most of which is performed by the film’s young stars, that makes it such a rewarding experience. What amazed me was how director Taymor managed to build a complete story around the various songs, inserting each one at just the right moment to ensure everything makes perfect sense. When Max introduces Jude to his fraternity brothers, we’re treated to a spirited interpretation of “With a Little Help from My Friends”, which pays homage to both The Beatles’ version of that song as well as Joe Cocker’s. Speaking of Joe Cocker, he makes a brief appearance in the movie, belting out “Come Together” as JoJo, fresh off the bus from Detroit, walks the streets of New York City. Along with Cocker, U2’s Bono also turns up as a psychedelic prophet (singing “I Am the Walrus”), and Jeff Beck provides a music-only rendition of “A Day in the Life”. But it’s the film’s cast that truly shines, from Jim Sturgess singing “I’ve Just Seen a Face” (in, of all places, a bowling alley) to Joe Anderson’s “I Want You (She’s So Heavy)”, performed when Max is at the Army Induction Center. With so many incredible musical sequences, it’s hard for me to pick a favorite, but if I had to, It’d be a tie between the three leads’ singing “Dear Prudence” (a scene that’s also visually stunning), and the gospel-influenced, very poignant version of “Let it Be”. Taymor does manage to throw a few non-Beatles references into the mix (Martin Luther McCoy’s JoJo looks exactly like Jimi Hendrix, while Dana Fuchs’ Sadie is an obvious tribute to Janis Joplin), but in the end, Across the Universe owes just about everything to Paul, John, George, and Ringo. 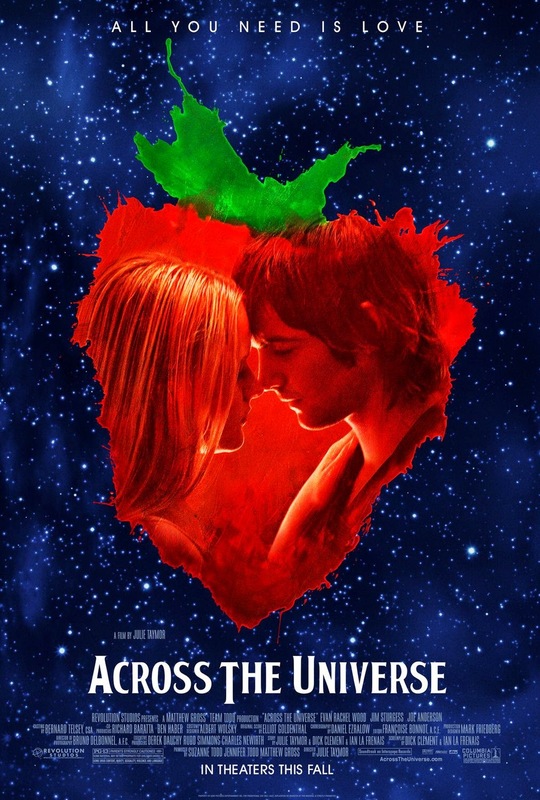 With rich characterizations and plenty of great music, Across the Universe ranks alongside Moulin Rouge as one of the most unique movie musicals of the young millennium. One of my all-time favourite films. My favorite track is hard to narrow down and the soundtrack has been a regular feature on my Walkman for years.